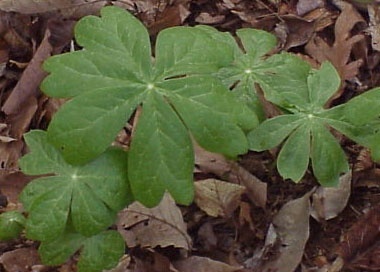 A perennial herb with large, umbrella-like leaves that primarily grows in woods and forests. Usually only 1 per erect stem, sometimes 2, approximately 4 to 14 inches in diameter. Leaves are circular in outline and divided into 5 to 9 segments that arise from a central point. Erect, unbranching, 8 to 20 inches in height. A single white flower occurs on each plant, approximately 3/4 to 2 inches in width with 6 to 9 petals. A relatively large (1 1/4 to 2 inch long) yellow or red berry that resembles an apple. 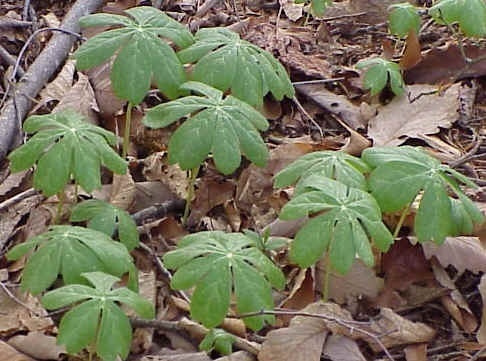 The tendency of this plant to grow only in wooded areas, the large, umbrella-like leaves that are divided into 5 to 9 segments arising from a central point, and the characteristic apple-like berry are all characteristics that help in the identification of mayapple.